The only thing better than gold is triple gold. Click here to play! Well, what about quadruple gold? I hear you ask. Well, that's just silly. 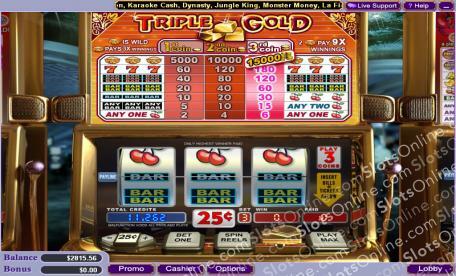 Triple Gold is a traditional 3-reel slot game played across a single pay-line. Simplicity is key in this retro slot and fans of the genre will be lapping it up as much as the newcomers. For those who enjoy the simpler times in life, you'll love Triple Gold as there are no bonus games or crazy scatters to keep up with or distract you. Rather, there are simply brilliant payouts on winning spins. For example, if you manage to spin three Triple Gold symbols, you will receive 15,000 times your initial wager! The minimum limit for any wager is 10c and the maximum is $10. Just think of how much you could win! Jump back in time and enjoy your winnings on Triple Gold.